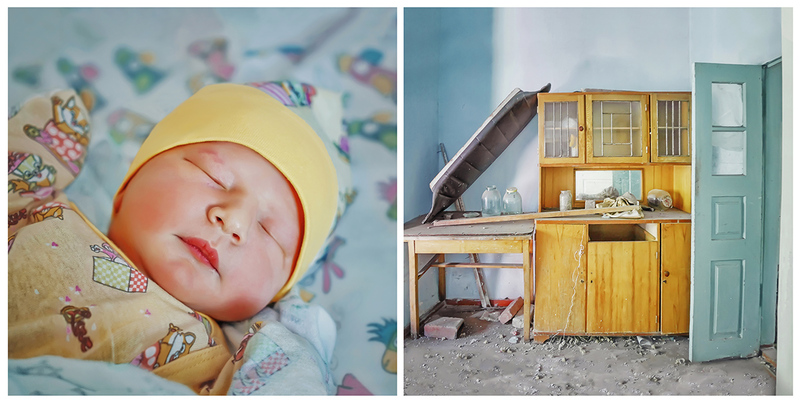 The idea of a pendulum goes through the series of diptychs. 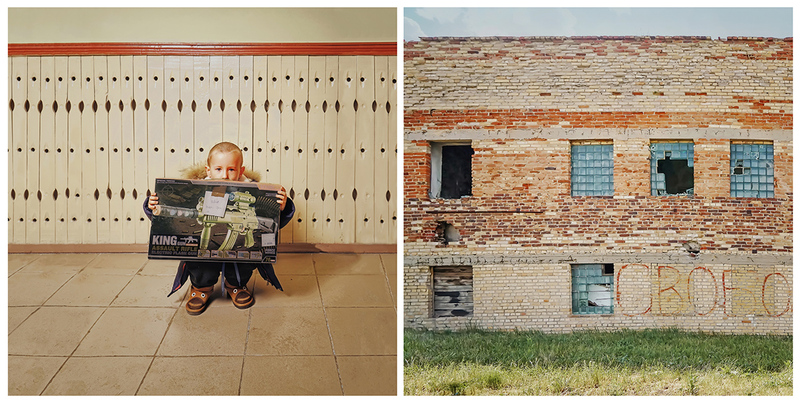 On the one hand, the viewer sees «skeletons» (this is what Ms. Grom calls houses destroyed by war) and ruins, and on the other, the look of a child which contains hope for a revival of this ruin. While describing her project Ms. Grom explains: nature is built on the principle of a pendulum, it is under its laws that war takes place and life revives. «War for a modern person has become a commonplace. When the war in Donbass has not yet begun but its approach was in the air, I dreamed that there were battles in the city. My family left before it became a reality. We went without looking back, abandoned the house and everything that we had. We thought only about the children and their safety. 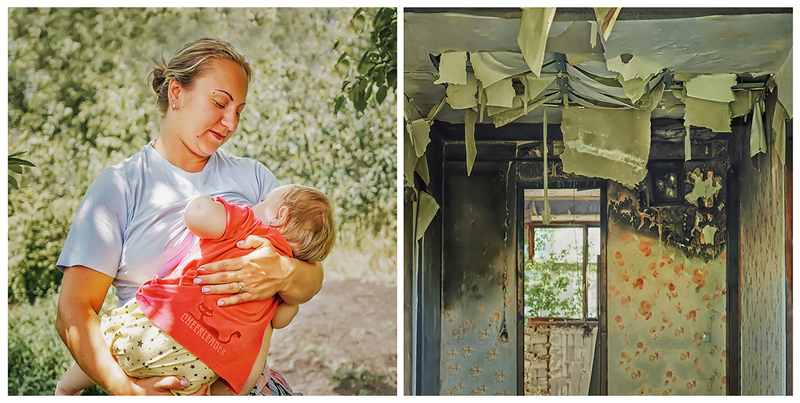 While taking pictures upon my return to Donbass I often met women with children. Children who were born during the period of hostilities. I asked, «How did women dare to give birth despite bombing, lack of medicine and elementary things? The danger is lurking at every turn for these people. It is terrible there. It is scary to live. 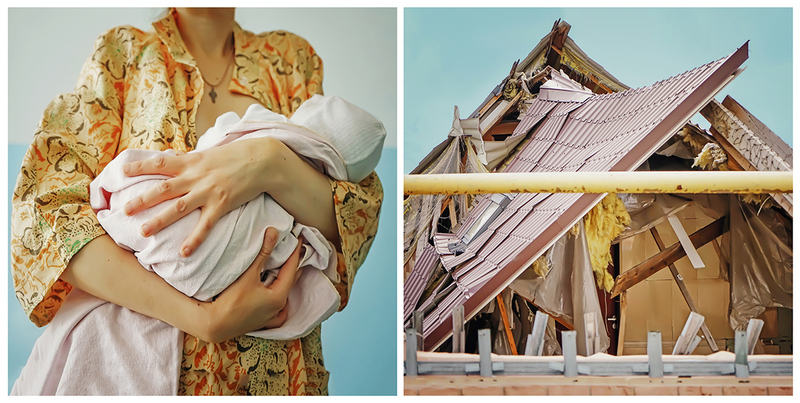 How did they dare to take responsibility for another tiny and fragile life?» Hearing different stories from people I have not found a general cause, except for one: nature is only governed by the laws of nature. Equilibrium is one of its main laws and man is part of this nature, its child. An increase of the birth rate during war is a kind of nature’s response to natural destruction. When war begins, life goes on. 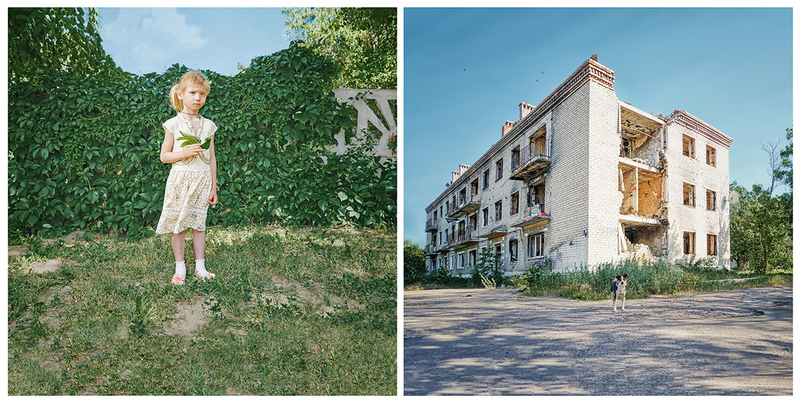 Alyona Grom, a photographer from Donetsk, began shooting her region with a camera as the war broke out: capturing its wounds, uncovering from media-militant reality an unobtrusive everyday life – a simple life of ordinary people who fall out from a meticulous eye of military cameramen. Ms. Grom, similar to the artists of the First World War, captures every detail passing it on to the next generation. Like most of her projects, «Pendulum» is an important finding for cultural historians because the author reproduces poetry of everyday life in it, sometimes not simple, without rhymes and metaphors, but the one that cannot but bother. Ms. Grom’s heroes are the entire generation that grows during hostilities. In the center of her frame are children of war born under firefighting and bombing. 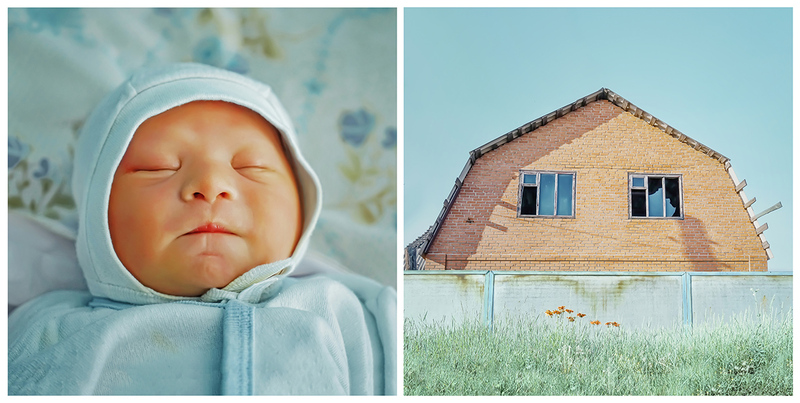 Newborns, those who have already learned to walk and run, and adolescents of «transitional» age with a rather specific and keen sense of love and its necessity. Another Ms. Grom’s hero is Donbass, a native region, burned by war. 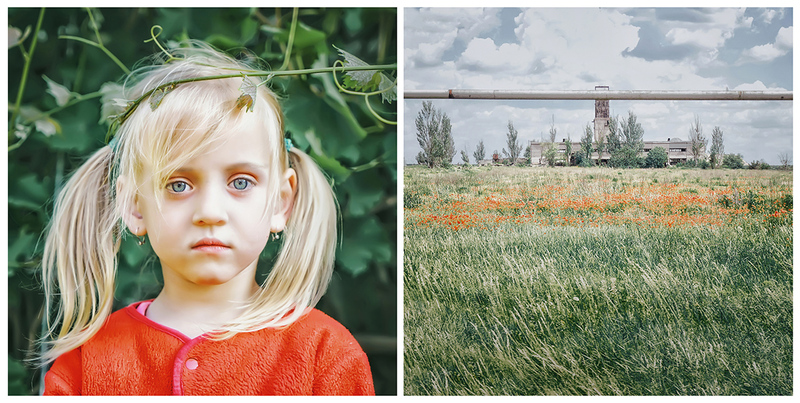 In photographer’s frames it appears to be different — industrial-urban, rural, filled with love and suffering. The author’s view, like a pendulum, switches from one hero to another. Ms. Grom observes the generation and the region reflecting on what will eventually win in this war. 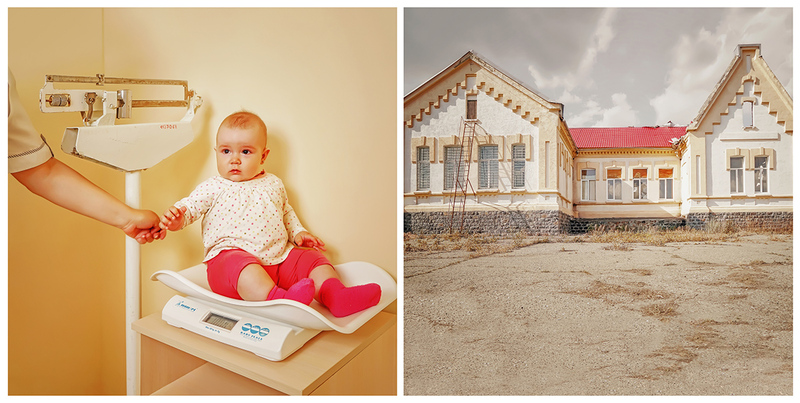 Visually this question is symbolically represented by the image of a baby lying on the scales. 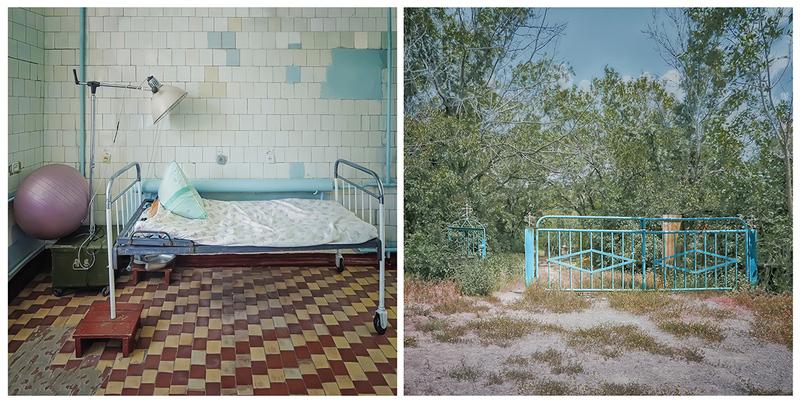 The idea of ​​a pendulum goes through the series of diptychs. 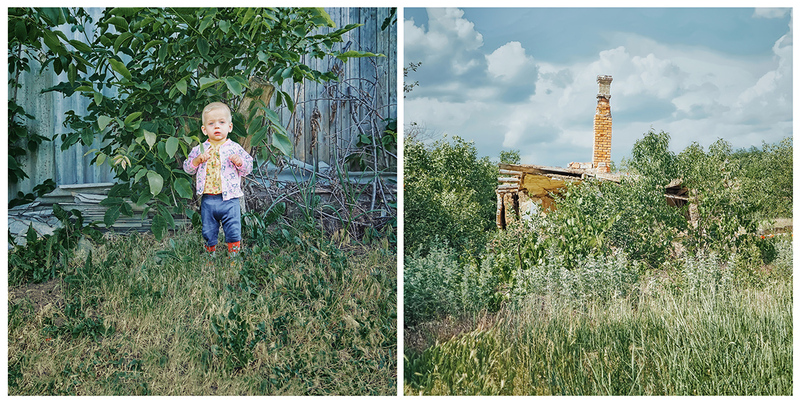 On the one hand, the viewer sees «skeletons» (this is what Ms. Grom calls houses destroyed by war) and ruins, and on the other, the look of a child which contains hope for a revival of this ruin. While describing her project Ms. Grom explains: nature is built on the principle of a pendulum, it is under its laws that war takes place and life revives. «War for a modern person has become a commonplace. When the war in Donbass has not yet begun but its approach was in the air, I dreamed that there were battles in the city. My family left before it became a reality. We went without looking back, abandoned the house and everything that we had. We thought only about the children and their safety. 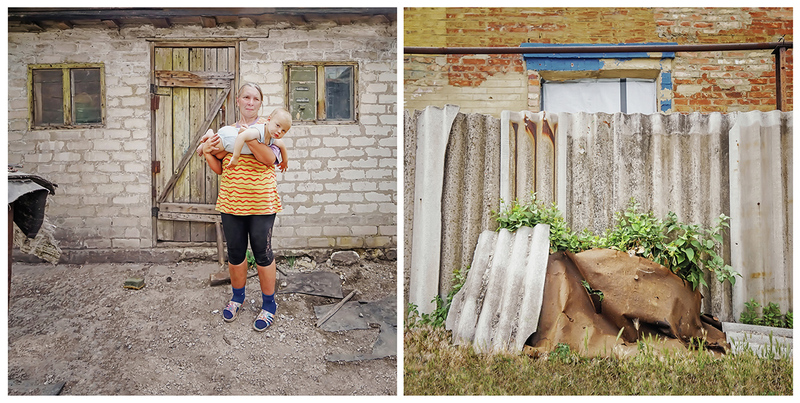 While taking pictures upon my return to Donbass I often met women with children. Children who were born during the period of hostilities. 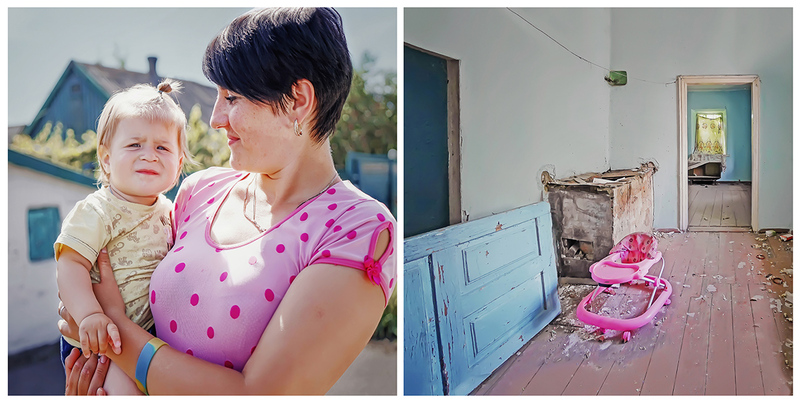 I asked, «How did women dare to give birth despite bombing, lack of medicine and elementary things? The danger is lurking at every turn for these people. It is terrible there. It is scary to live. 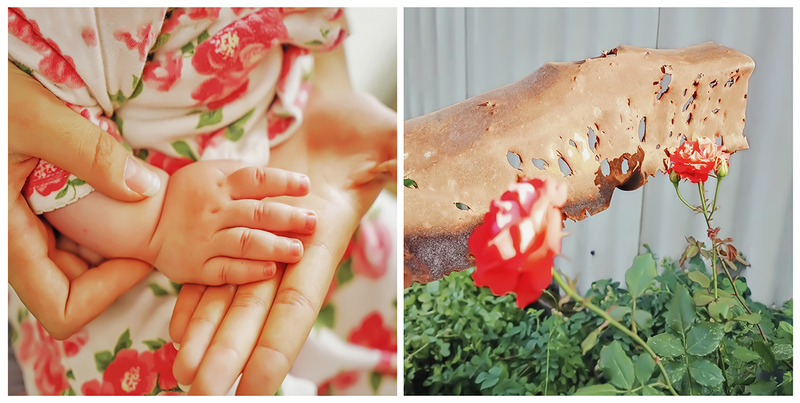 How did they dare to take responsibility for another tiny and fragile life?» Hearing different stories from people I have not found a general cause, except for one: nature is only governed by the laws of nature. Equilibrium is one of its main laws and man is part of this nature, its child. An increase of the birth rate during war is a kind of nature’s response to natural destruction,» – Ms. Grom commented. 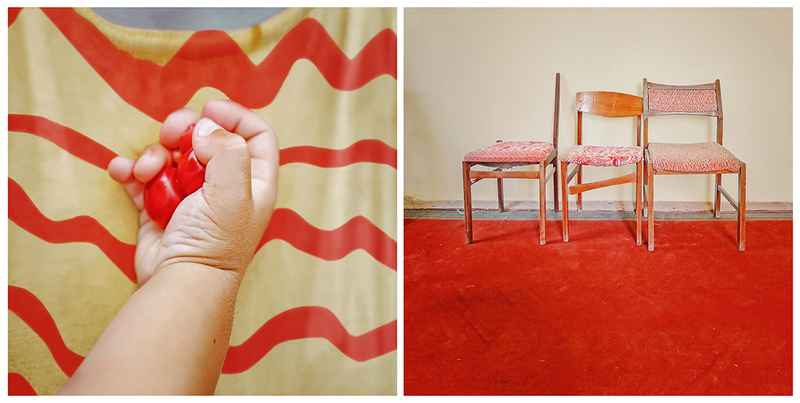 The photo series is full of important symbolic details. According to the author, the square size of each part of the diptych, where each side is equal to the other, is a reference to this equality of forces – death and life. Square as a geometric symbol has an important semantic meaning that is associated with equality, straightforwardness, order, monotony and earth. Square embodies the main spatial landmarks organized in the opposition. Square itself is the basis of many architectural constructions (zikkurat, pyramid, pagoda); altars are also square. This format has a clear association in today’s world: square pictures of a social network Instagram have become a visual frame of the day we live in. Personal pages of people in the social network as huge personal archives open to their reader «square» illustrations — personal memories, documentary and historical evidence that require a new approach to reading and attribution. When we see similar pictures, we inevitably compare this to our news feed on the social network. However, in contrast to the constant frames of luxurious buildings from tourist trips, the moments of happiness and success that limit our sight and «filter» our ideas about the world, in Ms. Grom’s work we are constantly in a turning point. First of all it refers to another reality, understanding of other social standards, cultural situation and the Other. Modest bourgeois joy promoted by social networks with their love for brilliant life faces lack of elementary social guarantees, security issues and economic problems. 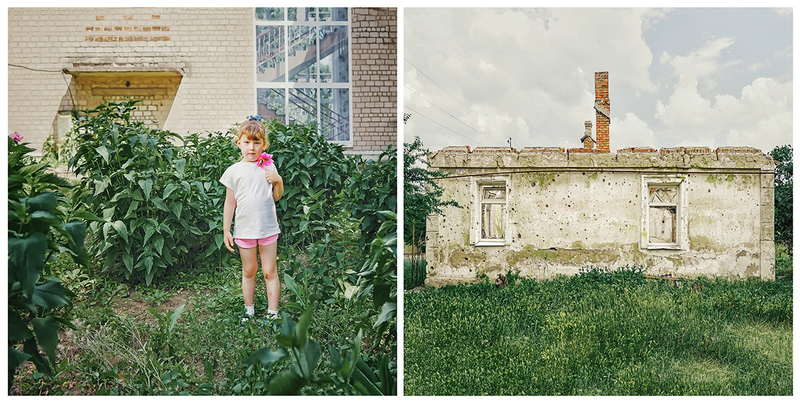 Today’s fragility and uncertainty is visually embodied in many ways but it is expressed more clearly in a diptych created in Marjinka and Krasnogorovka in June 2018. 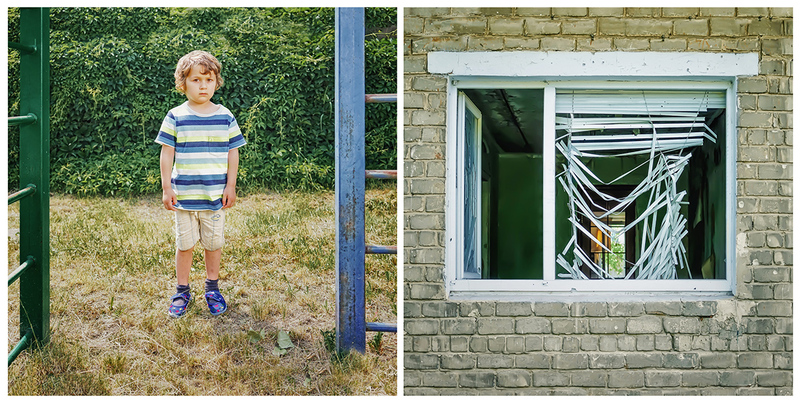 On the left there is a portrait of a child: a boy in a colorful T-shirt and shorts poses at a playground which the viewer does not actually see. On the right side of the diptych the straight and colorful lines of his clothesare discolored and deformed. The author shows a house damaged by shells. She peeps inside a room and she finds nothing but broken shutters and no trace of people there. These blinds are like shabby clothes of this house. In the traditions of romanticism a ruin has acquired a special aesthetic value. The artists of this age saw in it an incredible beauty that sent away primarily to the ancient traditions. The fragments of buildings, like damaged human souls, conveyed the authors’ acute emotional experiences and their creative pursuit. Today the ruin is part of historical and cultural heritage. 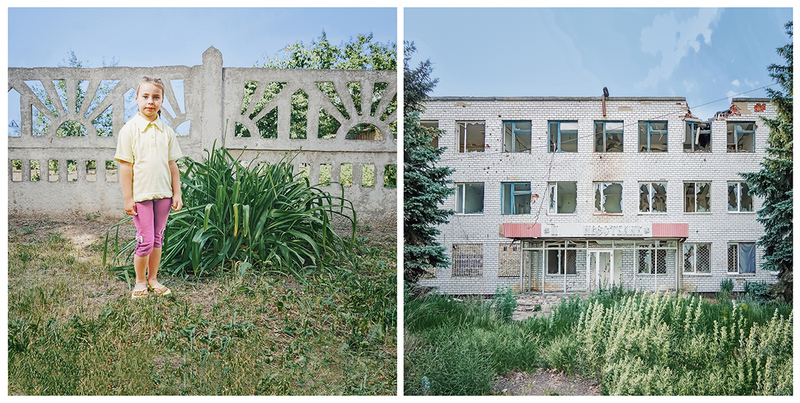 People are eager to photograph the «ruins from the textbooks» admiring their beauty. However, they try to protect their eyes from the modern ruins, from the fact that every day a number of such «inconspicuous» debris is just increasing. Of course, all these war-torn quarters cannot be called an advanced architectural style, nor can it be said that they bear historical and cultural significance on a global scale. Nevertheless, these houses of ordinary people are modern monuments to violence and disorientation in the heart of Europe.